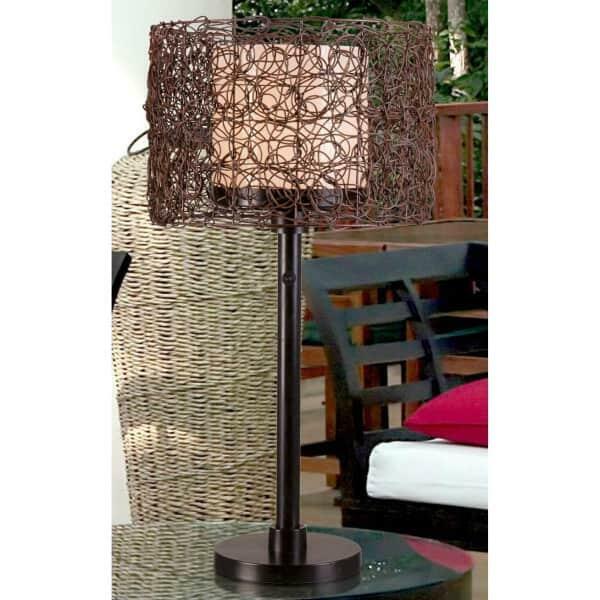 The Tanglewood Outdoor Table Lamp sits at 28’’ high, the ideal height for placement over a surface, like a side table or dining table. No longer will you have to head inside as the sun sinks. Your party may just be getting started! With advances in technology, outdoor rooms have the potential for the same comfort and functionality that indoor rooms provide. The Tanglewood Outdoor Table Lamp is equipped with those technological advances that ensure its safety in outdoor placement, rain or shine. The Tanglewood series of lighting has gone through testing by the UL safety organization, which gave its UL seal of approval for outdoor placement in wet areas, and guaranteed safety of the waterproof on/off switch. The Tanglewood Table Lamp is made with all rustproof materials and features a heavy base for steady standing, even during inclement weather. If the topsy-turvy rattan winding shade strikes your fancy, you’ll also enjoy the reasonable pricing and comforting safety features offered by Kenroy Home.